Typical hedges resemble green walls: straight rows of one type of tall, narrow evergreen, most frequently arborvitae. These green walls take up little space while giving property owners privacy, blocking unattractive views and dividing properties. But a mono-cultural hedge, despite its value as a fence, contributes less to the natural ecosystem. Not only that, but such hedges also require pruning. And when one or more of the plants in the lineup is damaged — crushed by a heavy load of snow or ice, for instance — the uniform image is ruined. Nagel favors a mixed “tapestry hedge” using a variety of deciduous and evergreen natives and non-natives of different sizes and looks. She finds that most property owners, even those with small lots, want to blend in with their natural surroundings. They want privacy, but they also want plants that provide interest, require little care and support local wildlife. Nagel also considers sustainability when planning a hedge. “To be mindful of resources, it is important to select plants that are appropriate for available sun, water and soil conditions,” she said. Plants that don’t need a lot of pruning to stay in bounds are a better choice for the environment. Nagel always includes at least two types of plants in a tapestry hedge and strategically places plants so they provide the desired screening. Even out of leaf, plants with dense structures, like native Philadelphus lewisii, can break up the view and provide interest, Nagel pointed out. Nagel also studies what is on the other side of a proposed hedge to utilize attractive borrowed views in the neighbors’ yard. Often, there is less need for blocking than a solid barrier would suggest, and if privacy can be achieved by carefully placing a few dense plants to block windows or views, the potential for a more varied look goes up. For one hedge project, Nagel decided to strategically plant three Sequoiadendron trees to block three windows. She filled in the tapestry with less-dominating plants where visual blocking wasn’t as needed. For another project, Nagel needed relatively fast-growing plants to hedge between a couple of two-story houses, so she strategically grouped several brightly colored Italian cypress, Cupressus macrocarpa ‘Wilma Goldcrest’, and filled in with other plants. Nagel has also used Teddy Bear® Southern Magnolia (Magnolia grandiflora ‘Southern Charm’), a relatively compact, upright shrub with glossy evergreen foliage, in combination with vertical yews (Taxus baccata ‘Fastigiata’) to hedge. Evergreen camellias and large rhododendrons work well for screening too, Nagel said. Brent Markus owns Rare Tree Nursery (wholesale) and Conifer Kingdom (retail and mail-order) near Silverton, Oregon. The Chicago- and Boston-based landscape designer/grower considers a number of factors when planning hedges for clients. First he asks, what is the shape of the space? Is there a linear run where trees are being planted in front of or in place of a fence? Or is the space twisting or unusually shaped? Second, what is the objective of the hedge? Is it to increase privacy by blocking the views a neighbor or the homeowner can see? Or does it have to do with blocking the view of a neighbor’s eyesore? “If we have the objective in mind, we can start to select the right tree for the right space,” Markus said. Third, is a solid barrier needed, or would an implied boundary be enough? “Often, an implied boundary beautifully separates two spaces and gives a sense of enclosure, without completely cutting off the other side,” Markus said. Although many homeowners would like a solid boundary, Markus said, planting an instant wall is often neither optimal for trees’ growth nor for their ultimate performance in a space. For instance, to create an implied boundary, some of Markus’ favorite trees to use are columnar, including Acer palmatum ‘Twombly’s Red Sentinel’, Liquidambar styraciflua ‘Slender Silhouette’, Picea glauca ‘Pendula’ and Pinus strobus ‘Stowe Pillar’. When a solid barrier is needed, “Evergreens are often the preference of a client, and arborvitae are, of course, the most often used,” Markus said. But, he recommends alternatives, including European beech, hornbeam and Portuguese laurel. “When using hedges at a property edge, often a straight line is utilized, but you can get very creative or even calculated in your approach to planting,” Markus said. One strategy Markus employs when working in an area that gets both sun and shade is to create a grove of trees of varying heights. For example, he planted a grove of 17 Alaskan false cypress (Chamaecyparis nootkatensis ‘Glauca Pendula’) with heights ranging from 3′ to 15′. “A single one of those trees does not block too much, but when you can layer them in a natural layout, they can have great power to both screen and develop a natural-looking space,” he said. Other choices Markus likes to use in groves with trees of varying heights are Pinus parviflora ‘Glauca’ and Pinus koraiensis ‘Morris Blue’. Wholesale grower Iseli Nursery in Boring, Oregon, offers a wide range of dwarf conifer selections. Sandy Dittmar, who works with consumer marketing relations, suggested several options that make good hedging choices. Several selections of Chamaecyparis nootkatensis develop into multi-purpose trees that grow tall and straight, then fill in at the bottom. Interesting character develops with age on ‘Jubilee’, an extremely narrow form with rich green foliage. ‘Pendula’ is a stately tree that produces a wider base, and ‘Strict Weeping’ grows into a tall, extremely narrow tree with an uncommonly pendulous habit. Picea abies ‘Pendula’, the weeping Norway spruce, has been used at the nursery to block the view of a shed. It can be staked to the desired height, and its flowing branches will fill in, becoming a solid wall, Dittmar said. Pinus nigra ‘Komet’, a more manageable alternative to ‘Arnold Sentinel’, grows more slowly and stays smaller. Dittmar anticipates this new offering from Iseli will gain popularity. Thuja occidentalis ‘Jantar’ PP22296 is a variation on the typical arborvitae hedge, boasting brilliant yellow foliage that turns glowing amber in winter. Fran Sharp, who represents wholesale grower Bizon Nursery in Hubbard, Oregon, encouraged the use of mixed hedges too. Most of Sharp’s recommendations for using deciduous and evergreen shrubs and trees for screening are readily available in the industry. Buxus sempervirens ‘Graham Blandy’ lends texture and stays very narrow. 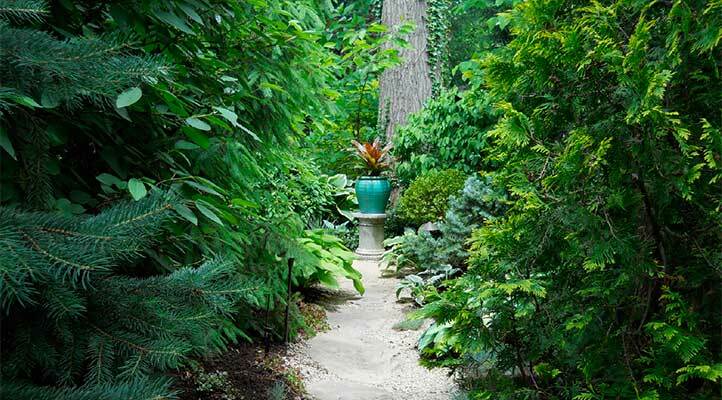 To break up a row, insert Chamaecyparis nootkatensis ‘Green Arrow’, a tall, skinny, draping conifer. Cedrus atlantica ‘Fastigiata’ is a great choice for the Pacific Northwest. Its blue foliage and soft texture fit right in. Cephalotaxus harringtona ‘Fastigiata’, a very underused plant, likes shade, resists deer and has more substantive needles than Taxus. Icy blue and narrow, Chamaecyparis lawsoniana ‘Blue Surprise’ breaks up a hedge with color contrast and its spire shape. Picea omorika ‘Pendula’ has silver blue needles and an elegant, draping form that stays fairly narrow. Pinus flexilis ‘Cesarini Blue’, a compact grower that is blue, soft-needled and upright, and P. f. ‘Vanderwolf’s Pyramid’, which has been around a long time, are both beautiful choices. Pinus parviflora ‘Tempelhof’ is a blue, upright tree that adds an alpine look, whereas Pinus strobus ‘Fastigiata’ has very soft needles and provides contrast when placed next to more coarsely textured plants.